This component is obtained by removing most of the plasma after centrifuging whole blood collected into anticoagulant. Red cells may be resuspended in other additives to prolong storage and are filtered to remove most leucocytes. A red cell unit is divided into four packs of equal volume to create Red cells Paediatric Leucocyte Depleted. This is to reduce donor exposure for small paediatric transfusions and to minimise product wastage. 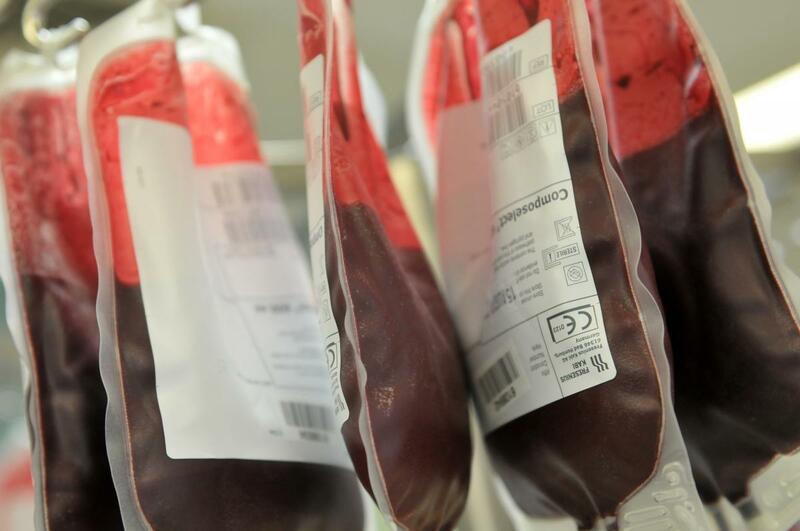 Washed leucocyte depleted red cells are prepared using a manual process that double washes leucodepleted red cells (<14 days old) with Saline Adenine Mannitol Glucose (SAG-M) solution to remove the majority of plasma proteins, antibodies and electrolytes. The washed red cells are then resuspended in SAG-M solution to preserve their shelf life. Red cells must be stored at 2 to 6 ºC and have a variable shelf life. Information is based on the typical unit content (mean ± 1 SD) from Blood Service data (1 January to 31 December 2017 inclusive)* and acceptable specification limits (in parentheses). Initial data for typical contents based on validation studies for new two-step SAG-M washing process. Leucodepleted red cells are available in Group O, A, B and AB, and RhD positive and RhD negative groups. Red cells can be phenotyped, washed, CMV-seronegative, frozen and irradiated.